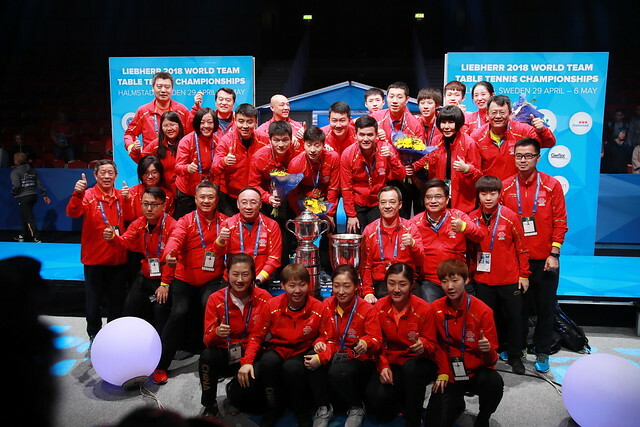 Tickets sold out, hopes of a sensation but it was not to happen; China beat Sweden on the morning of Saturday 5th May to reserve their place in the final of the Men’s event at the Liebherr 2018 World Team Championships. A three-nil win was recorded by the trio comprising Ma Long, Fan Zhendong and Xu Xin against the host nation’s Mattias Karlsson, Kristian Karlsson and Jon Persson. Just two games surrendered by Ma Long since Moscow in 2010 in a World Team Championships, those being the previous day against Austria’s Robert Gardos; for Mattias Karlsson, a quite prodigious task awaited as he faced the reigning Olympic and World champion in the opening contest. Great credit must go to Mattias Karlsson, as always he gave total commitment and challenged Ma Long in the rallies but in such situations the Chinese are always the favourites, the techniques being par excellence. Notably, in the third game Mattias Karlsson came close, he saved three match points but saving a fourth proved a step too far. Ma Long prevailed (11-6, 11-5, 13-11). A brave effort by Mattias Karlsson, it was the same from Kristian Karlsson who held one game point at 10-9 in the opener before losing 13-11 and then with the backhand in full flow securing the second. The Swede had raised his level, in the next two games Fan Zhendong followed suit; imposing, he beat the gallant Kristian Karlsson in four games (13-11, 8-11, 11-3, 11-2) to give China a commanding lead. China now one match away from a place in the final, in the same vein as his colleagues, Jon Persson rose to the occasion; after being somewhat overwhelmed in the opening game against Xu Xin, Jon Persson saved a total of three game point in the second but that was the nearest he came to causing an upset. Xu Xin prevailed in straight games (11-6, 13-11, 11-5) the place in the final was secured. It is the 26th time China has reached the final of the Swaythling Cup since 1961 in Beijing; overall it was the 29th time that China has competed in the last four. Various systems over the years, there has not always been a semi-final as in the present system.